Reno is home to a month long summer celebration of art. Every July, Artown takes over and there are tons of daily activities from world-renown musicians to hometown heroes with all kinds of creative talents. Then, August swelters into September and Labor Day weekend is the pinnacle of the Burning Man festival on the playa of the Black Rock Desert not too far from the casino lights of town. 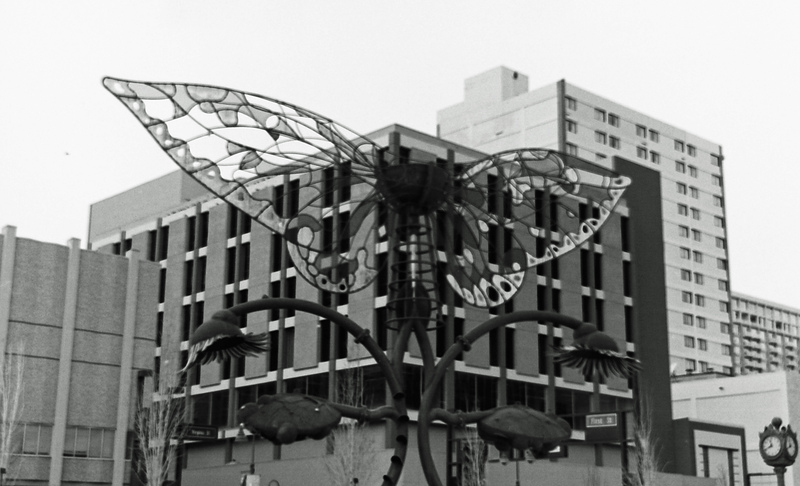 While I was on my photowalk with film a couple of weeks ago for the 52 Rolls project, I found a butterfly, a BIG one. 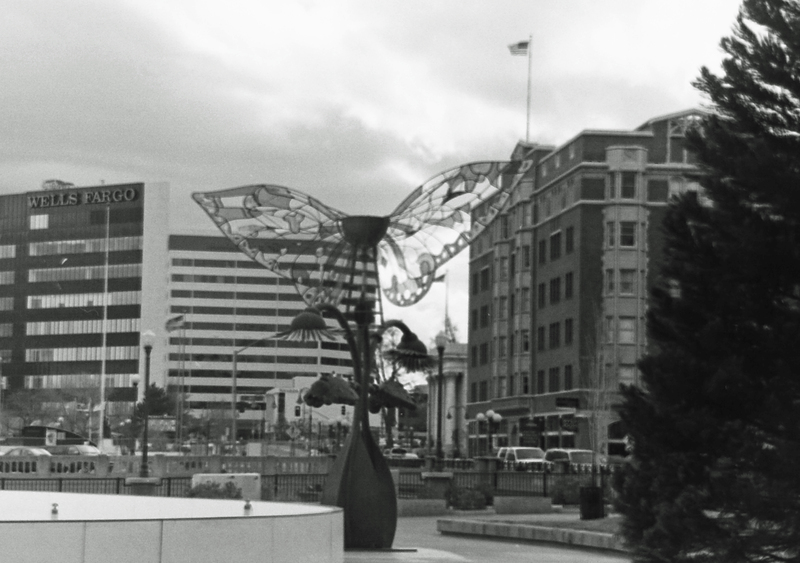 What on earth is a big, steel, butterfly thing doing next to the temporary ice rink in downtown Reno? Well, back to all of that stuff about art and Burning Man. This sculpture piece by Bryan Tedrick was part of an installation at Burning Man in 2008. The downtown renovation project brought the sculpture to this location last summer and the website lists it as temporary but I hope it stays. If you think this looks interesting black and white, you should see some of the other artist’s photographs in color by light of the moon in the desert. Bryan’s website has several photos but a quick Google search shows how well photographed this sculpture is. 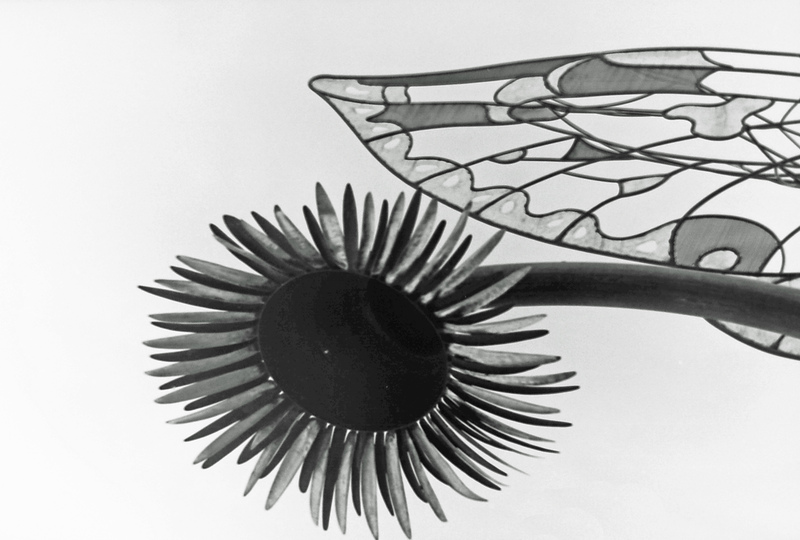 There are a couple of interpretations on what the butterfly and flower-type petals represent but I’ll let you soak it in and decide what you see. I shot this when I did my downtown walkabout a few weeks back. I need to post it. Really like the third shot. Love it! Yes, Reno has a surprisingly awesome art scene.